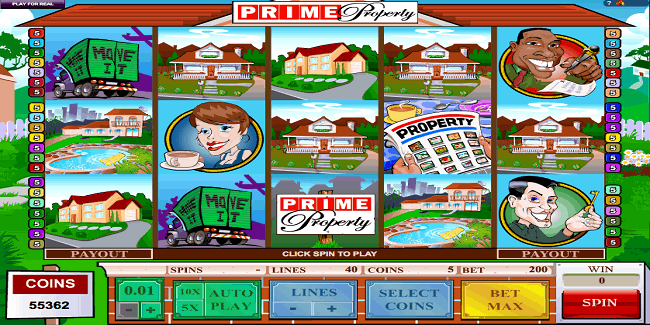 Prime Property Slot is 5 reels and 40 Paylines slot game powered by Microgaming software platform. The slot game is perfect to play which offers a jackpot of 2000 times of your total bet. Return of the player percentage for the game is 95.99%. The game features different kinds of diverse real estate agents and houses. The Prime Property symbol is the wild card in this game, while Movie It icon symbol is the scatter here. Yu can play Prime Property Slot at any Microgaming casino site that is accepting players from your country. Minimum cons per line for the game is 1 and maximum is 5, while minimum coins size is 0,.01 and max coins size is 0.25. it means a player can play the game for a chosen number of coins per line and with the help of coins size. In this slot game “Select coins’ is used to Choose the number of coins wagered, “Select lines” is used to Select the number of enabled paylines, +/- is used to select the coin value and “Spin” option is used to Start playing the game at the selected bet. If a player wants to play the game for a number of times without any interruption then he would click on “Auto Play” option and then select the number of times. Meanwhile ‘bet Max’ option is used to turn the reels at the maximum bet. There are plenty of free spins available in this particular slot game. If a player hits 3 or more Morning Paper symbols on any active paylines, he would trigger Property Bonus game. Players could win up to 40 Free Spins in this slot game.